Although it is hard to believe, men's trousers are almost a hundred years old. You can boldly say about them: timelessly comfortable and masculine. And it will probably remain so. Although these pants have their opponents - men still feel in them and look like ... real men. The history of the militias dates back to the 1930s. Then they began to serve British soldiers who quickly appreciated their endurance and comfort. In the army, they proved themselves mainly due to the characteristic side pockets - a perfect place for additional ammunition. The soldiers could reach for it even when crawling, which would not have been possible if the pockets were sewn in front. Soon after, militias were appealing to representatives of the American army. The images of warriors from the United Stated Army, circling the world with the help of the increasingly popular media, aroused the admiration of many women and the jealousy of many a man. As a result, the military style penetrated the civilians' wardrobe. Who, when setting up trousers, wanted to feel comfortable and ... manly. M65 pants from Helikon-tex were sewn on the model of legendary militias worn by soldiers of the American army. The abbreviation M65 stands for the winter uniform system of the US armed forces, which was developed in the 1960s. He replaced the M51 uniform - less durable and heavier. Greater durability is achieved by using cotton in combination with nylon in half and half proportions (this material is called NYCO and covered the top layer of the uniform). It turned out that such material is much more resistant to wind, frost, rain or snow. Nowadays, in the US army, a different kind of uniform is used, but the M65 has gained a reputation as a cult - it served soldiers for almost half a century (from 1966 to 2005). An interesting fact is that the military regulations imposed on the representatives of the armed forces the obligation to wear underwear under the pants M65. Today, we can apply to it or not - depending on weather conditions and personal preferences. Regardless of the unfavorable opinions of men's fashion specialists - militias are still very popular. Modern men of flesh and blood do not bother that popular fashion bloggers do not associate this type of trousers with rebellious representatives of youth subcultures or retirees on fish. Men also do not see a problem in the fact that militias with specific styles have also reached women's wardrobes. Where does loyalty to this type of pants come from? First of all because they are really comfortable. And what follows - practical. They work well on lazy afternoons and during murderous survival camps. Thanks to seven pockets they fully deserve the title of "cargo". With this term we will meet in the case of militias because of their pockets. 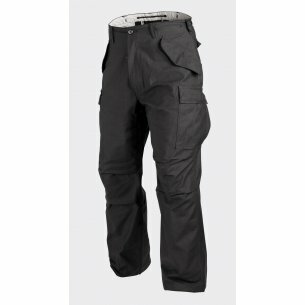 "Cargo" means the load, and in the pockets of our pants will actually fit a lot (2 normal pockets on the front with flaps with snaps + 2 pockets on the back with flaps with snaps + 1 inner pocket fastened with button = 7 pockets, as in the original M65 pants ). It is worth noting that the side pockets emphasize the musculature of the legs and in the case of lean men optically "add" the volume to the four-sided muscles of the thighs. Uncommon cut and subdued colors mean simplicity, which men also appreciate very high. Helikon-tex offers pants in three colors: black, olive-green and us woodland. As for the last two of these colors, the pants were produced in these colors for US Army soldiers. First, in green olives (1966-1991), then moro (in 1981-2005). It is not without significance that choosing the color of other garments for each of the shades offered is not a major problem. In general, it is very easy to choose the rest of the outfit for the militias - to make the whole thing look like it should be all you need is a favorite t-shirt or sweatshirt. The Helikon-tex brand products are created for the most demanding customers. These are both uniformed services (soldiers and policemen) as well as individual recipients, who value the high quality of military-style clothing. Among our regular clients are hunters, members of paintball and airsoft teams as well as those who just like military style. Helikon-tex is a manufacturer of military uniforms, technical and thermoactive clothing and headgear as well as backpacks and pouches of the molle system.